I love the feeling when I am suddenly notified of something I need to pay attention to. What I don't like is being constantly reminded about how lucky I am that someone is keeping an eye on my activities. You see, I value discretion and seamless integration. Let's take mobile security apps for instance. What's the point of having a permanent icon in your notification bar? Moreover, do you really want to sacrifice speed and memory to have your device under constant surveillance? I mean your phone is not the CIA mainframe, is it? BitDefender Mobile Security features a decent collection of tools for security and application management. The Malware Scanner is an interesting beast. Using the power of cloud computing, malware scans are quick and easy without compromising device performance. So for instance if you were watching a YouTube video, you could even forget that a scan is underway. 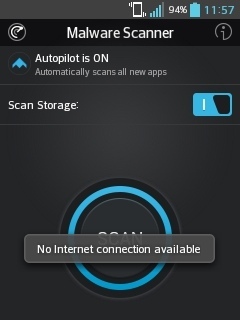 The drawback of this is that BitDefender cannot perform scans unless you're somehow connected to the internet. But don't worry. A phone that's detached from the web has a quarantine on almost any nefarious app that could ruin your day. Well, except those pesky ones that send SMS'es, but BitDefender should have caught those after having been installed. The Privacy Advisor is a tool that can be also procured on its own. The integration with Mobile Security is a good match. Similar to the Norton Mobile Security App Advisor, BitDefender creates a list of applications and sorts them into red circle, orange circle, half orange circle and green circle, to show how threatening each is. Out of those the advisor compiles a score to give you a general feel on how safe you should feel. Other features include an app locking tool that holds specific apps under a PIN lock, a web watcher that blocks flagged content (on Android and Chrome browsers) and an anti-theft control screen where from you can switch on different security options including an SMS command feature. Malware Scanner – Can only perform while online. Clueful Privacy Advisor – Gives information about the currently installed apps. Anti-Theft – standard features such as Locate, Lock, Wipe but also has SMS Commands. The Malware Scanner is impressive, and although it only works online it does its job very well. Also the fact that Bit Defender does not place a permanent notification icon is a great plus for me in particular. 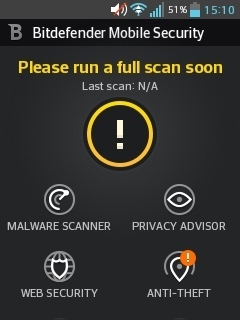 The malware scanner is fast and reliable. You no longer have to keep Clueful installed as a separate app. It has a low profile and is light on the device's resources. You don't have the option of placing dangerous apps in quarantine. Scans cannot be scheduled on a calendar. The BitDefender security software has been quite reliable on the PC medium, no surprisingly this tradition is being carried on. Although mobile platforms are not PC's BitDefender Mobile Security runs a smooth business.